Supermaterial graphene is among the world's strongest, thinnest, and most flexible substances, and, according to a newly published scientific paper, it can now be made using a standard kitchen blender. They took a high-power (400 watt) kitchen blender and added half a litre of water, 10 to 25 mls of detergent, and 20 to 50 grams of graphite powder (found in pencil leads). They turned the machine on for 10 to 30 minutes. The result, the team reports: a large number of micrometre-sized flakes of graphene, suspended in the water. But don't break out your own blender. First, because you don't want little flecks of leftover graphite, graphene and detergent mingling with your banana-raspberry smoothie in the morning. (Seriously, you don't.) 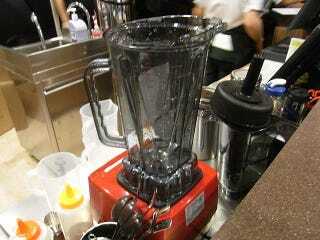 But also, Coleman hasn't revealed the precise measurements that yielded the blender graphene. He's working on getting that recipe ready for publication now, he says. You can read more over at Nature News or read the whole paper over at Nature Materials.